A few years ago after reading about the Mayan 2012 factor and traveling to the Yucatan, I came up with this animation to try and understand and visualize the Mayan Calendar from hundreds of years ago. Each frame represents one day. Right click on a PC or (Use the CTRL key on a Mac) to zoom into the diagram for greater detail. Rollover the discs to see the cycles. One of the most curious things is how the Mayans perceived time in cycles, which in some cases interlocked. 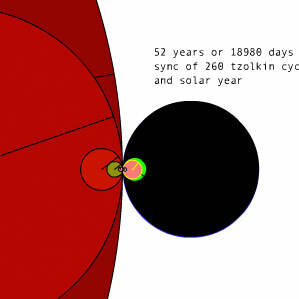 For instance one 260 day cycle, called a Tzolkin, synchronized with a Solar year every 52 years. One Tzolkin was also equivalent to nine months, or the gestation period of a human being. They also counted everything in multiples of 20 which was based on twenty fingers and toes. This led to their Long Time counting cycles which are multiples of 20. These are the Tun, Katun, and Baktun which are on the left. In our year 2012 AD, 13 Baktun cycles (the largest circle) will officially end, and supposedly the Universe will end as well and start anew with another cycle. The Mayans also went as far as to align the architecture of their cities according to the angles of the Sun, Moon, and planets. The most important palaces of government and aristocracy were aligned to the rising position of Venus. alright well what if they line up?